On Wednesday, members of the Cemetery Committee spent their day hiking into the dozens of small cemeteries that dot Westport Island. They placed 50 flags to honor our veterans in readiness for today’s tradition of taking time to remember and celebrate the service of those who sacrifice and serve in our nation’s armed forces. Following is a reprint of the Dedication from the 2003 Westport Island Town Report written by Bill Wright to give a face to one of the Islander’s who served: his father, Adrien Wright. Dad was a gunner on a B17 bomber in World War II, was shot down over Germany and was in a prison camp for 1 1/2 years. Mom and Dad (Adrien and Mary) moved to Westport Island in the summer of 1947. They purchased the Old Parsonage House, on top the hill on the left side of West Shore Road, from George Knight. We had great neighbors there across the road in the summer with Ester and Lewie Doyle and of course George Knight. Dad dug clams for two summers, purchased an old lobster boat and hauled clams up and down the river with friends, Amos Knight, George Spinney, Jack McEachern, Frank Fowler and sons and many others. In 1950, Dad started digging saltwater worms for Fred Bolwin of Woolwich and liked that so much he started his own worm business in the spring of 1951. For many years, he purchased worms from diggers on Westport Island. Almost all the men, young and old, that lived on Westport Island dug worms for Dad at some time or another. In the spring of 1962, Adrien and Bill Wright started Wrights’ Bait, Inc. We started buying sea worms from all along the coast of Maine. In 1969 both families, Mom and Dad, Bill, Jeanine and kids all lived in Addison, Maine and ran a large Marine Worm Business there. In 1976, Ade and Mary moved back to Westport Island, retired from the worm business and remained on Westport Island enjoying many happy days with friends and family. Mom was a self-taught pianist and enjoyed playing the piano at family gatherings. She also enjoyed her flowers and flower gardens. Their home at this time was at the property of the old ferry landing. The last time I was with Dad, i took him out on his deck and we looked up and down the Sheepscot River. He said, “Bill look how beautiful this is”. At a time when bad news is more common than good for much of Maine’s fishing industry, Westport Island’s Shellfish Committee led by Chair, Lincoln Richardson, is sharing high fives. After almost 15 years of closures, Squam Creek is open for clamming to start off the Island’s shellfish season which began on May 1. For now, the Creek flats will only be open until June 1. 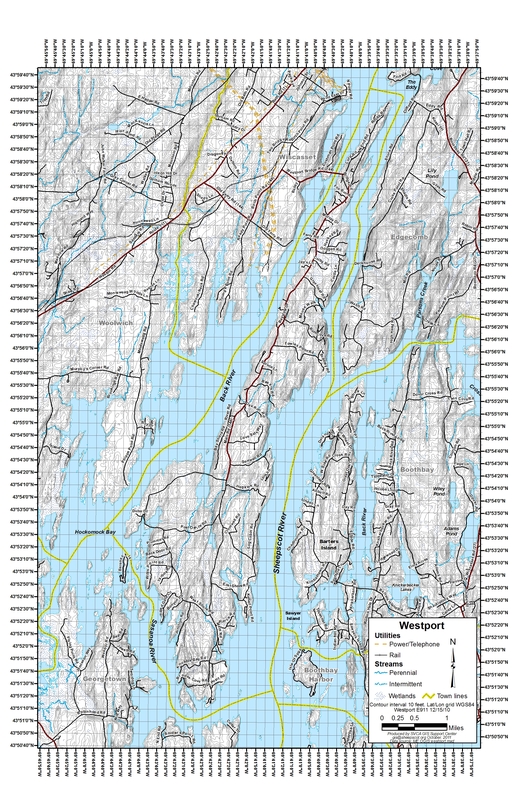 But thanks to the collaboration of the Shellfish Committee and the State Department of Marine Resources (DMR), there is hope that Squam Creek will reopen in September for a fall harvest. The first license holders to dig are happy to report an abundance of clams compared to what they have been seeing on Westport flats these past few years. For a $15 recreational license good from May 1 to April 30, Island residents can dig as much as a peck a day while Squam Creek is open — or dig in other open flats throughout the year (closures can be checked daily on the DMR website; licenses are available at the Town Office). That’s a pretty good deal for steamers, “chowdah” and clam you-name-it. Squam Creek has been the Island’s most accessible and abundant recreational site for clamming for much of its history. A State Shellfish Population Survey in 2004, resulted in a one-year closure for reseeding. That closure turned into another year to allow clams to reach their “legal size” of 2 inches. After an extensive resurvey in 2006, the flats reopened for a time and were soon restricted to recreational digging to continue restoration to healthy levels. Happy 100th Birthday to a great lady! Yesterday, Vera Cleaves turned 100. She became the first recipient of Westport Island’s newly acquired Boston Post Cane. The cane will be displayed at the Town Office with a plaque commemorating Vera’s stature as Westport Island’s oldest resident. She was given a pin attesting to this place of honor in our community. Despite hail and pouring rain, friends and family turned out to celebrate Vera at an informal “party” at the Ship’s Chow Hall in Wiscasset hosted by owner Tina Fitzsimmons. Lincoln County News reporter, Charlotte Boynton, was on hand to record the event. Since she was eight years old, Vera has been a part of Westport Island visiting her grandparents’ camp overlooking the Sasanoa River. On her first visits to the Island around 1922, the Steamer Wiwurna was a primary mode of transportation to the Island; Black Friday and the Great Depression had not yet occurred; and the Great War was not yet a part of history. Vera has seen a lot of history go under the bridge; she has played a groundbreaking role in some of it. Vera has lived her life with distinction as a veteran of World War II and as an educator. When the Second World War broke out in Europe, she volunteered with the Red Cross in Boston becoming an ambulance driver part-time while working in the actuarial department at John Hancock. Three months after it was created in 1943, she enlisted in the Women’s Army Corps (WAC). From basic training, she was sent to Stewart Field in Newburgh, NY, the “Wings of West Point.” There, she learned to fly the Army’s AT-6 as part of her training to teach coursework in flight maintenance to U.S army aviation recruits and West Point cadets. She also instructed fellow WACs serving alongside her in physical fitness and marching – all 123 of them. She served the duration of WWII at the West Point airfield as one of the pioneering women who served with their male peers in the US Armed Forces. After the war, Vera earned an education degree at Pennsylvania’s Millersville State Teachers College on the GI Bill. She was the only woman training in the industrial arts and drafting program. Her wartime credentials, along with her age, allowed her to once again break new ground in the workplace. Progressive school systems in the New York City area and Philadelphia that “saw the future” heavily recruited Vera as a female role model making her way in a man’s field. During 45 years as an educator, teaching in Philadelphia, New York, Massachusetts and Maine, Vera changed with the times. After achieving her Master’s Degree in Education at Penn State, she moved into school administration and college-level education instruction – always keeping a hand in industrial arts. As an administrator, she created and tested educational programming for exceptional and gifted children. Preparing young people with practical skills and knowledge to take on the challenges of the real — and very dynamic — world has always been her passion. She brought that passion back to Maine with her. Past students and educators in Gardiner, Bristol, Millinocket and Boothbay Harbor may remember Miss Cleaves and have stories to share.